For the past 11 months, I have been enrolled in an art Academy in Salt Lake City, the Jeff Hein Academy. During this whole period I have only done drawing and, more recently, value, at the academy. There has been little time to paint. Still, I have had the opportunity to sit in on one of Jeff's painting workshops, and also listened to critiques and conversations he had with other artists, who are farther ahead in the curriculum than I, about painting. Just from these conversations and observations (as well as my own value studies in black and white) I have already learned a lot that seems to have helped me with my painting. This weekend I went back into the painting above to apply some of what I feel I've learned, albeit somewhat as an aside to my daily studies at the academy. I think it is much improved. Below is the original version of the painting right after coming home from a plein air painting session with a friend. It is not refined and the photograph isn't a good one. Still, I think one can see the increased sensitivity to color and value that I've already developed. It is exciting to see that the hours I've already put in at the academy (approximately 20-24 hours per week) are having an impact. It's been a long time since I've posted new work. I've been spending 4-6 hours per day at the art academy (Jeff Hein Academy) where I've been enrolled since Oct. 2008. 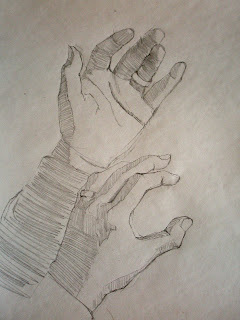 During that time, I've been drawing, mainly from plaster casts. I will post some of those drawings soon, as an illustration of the kind of work I'm doing there. 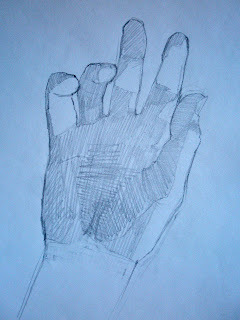 These drawings, however, are of hands (my own), small exercises I've been doing at home to prepare for a new painting which will involve not only normal still life but also some images of hands.